The transmission and distribution systems are similar to man’s circulatory system. The transmission system may be compared with arteries in the human body and distribution system with capillaries. They serve the same purpose of supplying the ultimate consumer in the city with the life-giving blood of civilization–electricity. 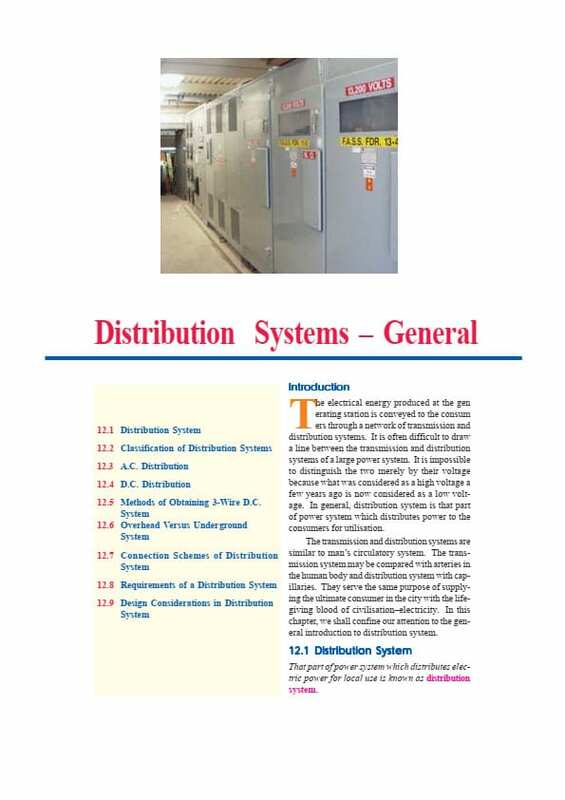 In this guide, we shall confine our attention to the general introduction to distribution system. That part of power system which distributes electric power for local use is known as distribution system. In general, the distribution system is the electrical system between the power substation fed by the transmission system and the consumers meters. It generally consists of feeders, distributors and the service mains. Figure 1 shows the single line diagram of a typical low tension distribution system. A feeder is a conductor which connects the substation (or localized generating station) to the area where power is to be distributed. Generally, no tappings are taken from the feeder so that current in it remains the same throughout. One of the main consideration in the design of a feeder is the current carrying capacity. A distributor is a conductor from which tappings are taken for supply to the consumers. In Figure 1, A B, BC, CD and DA are the distributors. The current through a distributor is not constant because tappings are taken at various places along its length. While designing a distributor, voltage drop along its length is the main consideration since the statutory limit of voltage variations is ± 6% of rated value at the consumers’ terminals. A service mains is generally a small cable which connects the distributor to the consumers’ terminals. Now-a-days, a.c. system is universally adopted for distribution of electric power as it is simpler and more economical than direct current method. According to type of construction, distribution system may be classified as overhead system and underground system. The overhead system is generally employed for distribution as it is 5 to 10 times cheaper than the equivalent underground system. In general, the underground system is used at places where overhead construction is not practical or prohibited by the local laws. Each scheme has its own advantages and disadvantages and those are discussed later. Now-a-days electrical energy is generated, transmitted and distributed in the form of alternating current. One important reason for the widespread use of alternating current in preference to direct current is the fact that alternating voltage can be conveniently changed in magnitude by means of a transformer. Transformer has made it possible to transmit a.c. power at high voltage and utilize it at a safe potential. High transmission and distribution voltages have greatly reduced the current in the conductors and the resulting line losses. There is no definite line between transmission and distribution according to voltage or bulk capacity. However, in general, the a.c. distribution system is the electrical system between the step-down substation fed by the transmission system and the consumers’ meters. The a.c. distribution system is classified into: primary distribution system and secondary distribution system. It is that part of a.c. distribution system which operates at voltages somewhat higher than general utilization and handles large blocks of electrical energy than the average low-voltage consumer uses. The voltage used for primary distribution depends upon the amount of power to be conveyed and the distance of the substation required to be fed. The most commonly used primary distribution voltages are 11 kV, 6·6 kV and 3·3 kV. Due to economic considerations, primary distribution is carried out by 3-phase, 3-wire system. Figure 2 (above) shows a typical primary distribution system. Electric power from the generating station is transmitted at high voltage to the substation located in or near the city. 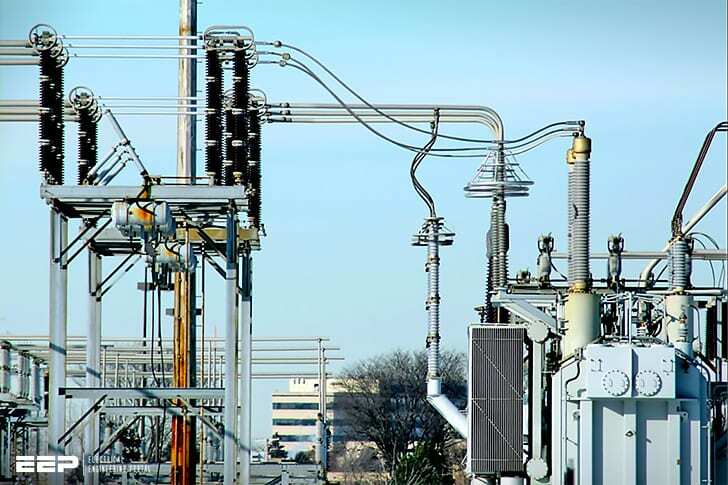 At this substation, voltage is stepped down to 11 kV with the help of step-down transformer. Power is supplied to various substations for distribution or to big consumers at this voltage. This forms the high voltage distribution or primary distribution. Is it possible to co-operate?